PORT OF SPAIN, Trinidad and Tobago (RNS) — Yesenia Gonzalez immigrated to Trinidad and Tobago, the twin island Caribbean nation, from Venezuela 40 years ago when she was 18. She has raised her children and set up a successful business here. But in recent months, Gonzalez has been spending less time with her loved ones and more time fighting for the safety of thousands of fellow Venezuelans fleeing to Trinidad and Tobago due to the economic and political tumult in their home country. This April, 82 Venezuelans were sent back to their country by Trinidad and Tobago officials. There have been other deportations in years past, but this one was significant because the Venezuelans were migrants seeking asylum or hoping to file for refugee status. Trinidad and Tobago’s government claimed they were held for various criminal offenses and said that the Venezuelans wanted to return home anyway. In the midst of the crackdown, Catholic Church leaders on the twin island are working to ensure Venezuelans receive compassion and a place to feel at home. Since then, Venezuelans in Trinidad and Tobago are afraid the same would happen to them. Efforts to speak with Venezuelans were mostly unsuccessful. Many are lying low as news of a “massive roundup” by officials spreads. The exact number of Venezuelans fleeing to Trinidad and Tobago is hard to come by. Chief Immigration Officer Charmaine Ghandi-Andrews said in April that 150 to 200 Venezuelans are entering the country every week. But that number doesn’t account for those being smuggled in or coming through different ports of entry. Ghandi-Andrews estimated that 60,000 Venezuelans had arrived between 2014 and 2016. There were 69 million refugees last year. What is being done to help them? 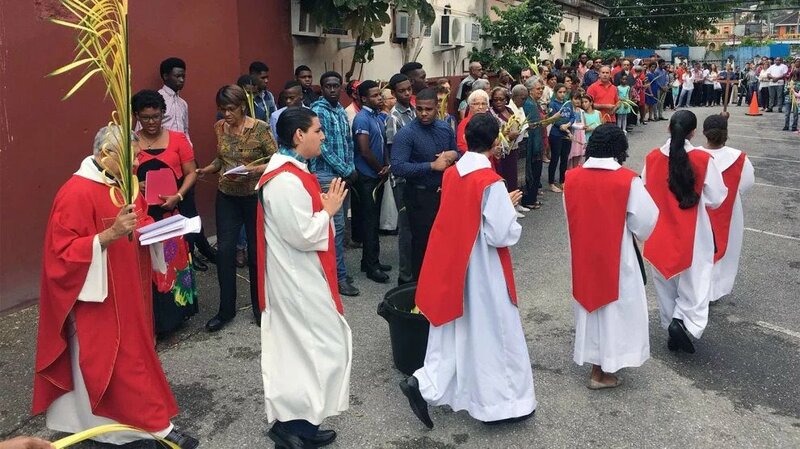 Following the April deportation, Archbishop of Port of Spain Charles Jason Gordon spoke out against the government’s treatment of Venezuelans and other migrants. He warned citizens against being “stingy” — and his new initiative is anything but. This May, the archbishop announced that a Ministry for Refugees and Migrants would be established in every parish and ecclesial community on the twin island. The initiative is launching on Wednesday (June 20), World Refugee Day. It’s in keeping with the “Bridges of Solidarity” project promoted by Pope Francis and the Vatican for Venezuelan migrants. Venezuelans and other migrants will be given food, clothing and shelter at any church on the island. They will not have to travel to the capital for help. Of a population of 1.365 million, 21 to 25 percent (300,000) of Trinidadians are Catholics, and there are 162 churches on the twin island. “We will ensure people get registered (and) become legal as early as possible,” said Gordon. He noted that in the 19th century, Trinidad and Tobago benefited from Venezuelan migrants working in the cocoa industry. “They didn’t take away from the country; they actually contributed,” he said. The Living Water Community, a lay Catholic organization led by co-founder and director Rhonda Maingot, has been working with the United Nations refugee agency since the 1990s to help migrants through its Migrant and Refugee Centre. In 2013, Living Water entered a formal agreement with the U.N. and the country’s Immigration Division to offer screenings, registration and care for migrants. In the past two years, they have seen 6,000 Venezuelans. But Maingot said that number could have doubled. Until Wednesday’s launch, parishes are busy preparing to receive the influx of Venezuelans seeking help. Gordon said parish training will sensitize lay Catholics to the plight of Venezuelans and teach them how to care for those in need. Gordon believes that both government and the church have a role to play. Maingot said that education and awareness are integral in changing citizens’ attitudes toward Venezuelans. “I feel horrified to see how we as a nation have turned against people in such need. God forbid one day we might be in a situation where we have to leave this country and leave everything behind." In the meantime, Gonzalez has been pleading with government officials to show leniency. She said fear and ignorance fuel how Trinidadians have been treating Venezuelans. As recently as June 8, Gonzalez heard the news that four more Venezuelans were deported. She said at least 104 are being held at the Immigration and Detention Centre in Wallerfield. Gonzales said she intends to hire lawyers to defend the rights of those seeking refuge.